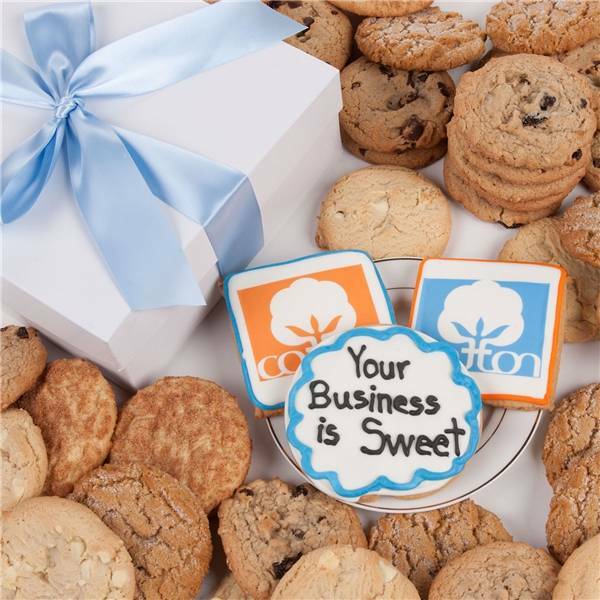 Two photo cookies and one custom cookie with your message adorn this delightful cookie gift packed with one, two, three or four dozen of our gourmet cookies. 3-4 weeks when unopened and stored properly. If you need 49 or less, you can order here. If you need 50 or more, click the REQUEST ESTIMATE tab above to contact one of our Gift Experts. Fill out the form below and one of our Gift Experts will get right back to you with an estimate. Need 49 or less? Click the ORDER NOW tab above to place your order today. The Photo Cookies Gift Box is a great way to surprise clients, employees or other important people to your business. Perfect for creative marketing campaigns, these custom cookies can be branded with your images, logo or other messaging. Included in the gift box is one hand-iced sugar cookie where you can display a message of gratitude, encouragement or anything else you'd like us to write in delicious icing. This gourmet cookie gift can be scaled to your needs with the option for 12, 24, 26 or 48 of our delicious gourmet cookies. Fresh-baked in everyone's favorite flavors, these boxes include Signature Classic Cookies of Chocolate Chip, Oatmeal Raisin, M&M® and Snickerdoodle. The custom cookies that are printed with your photos don't use edible paper, but the food-grade ink is applied directly to the icing for the perfect texture and flavor, with crisp lines and rich colors. For any questions about artwork or to include other marketing materials with your corporate gifts, fill out the Request Estimate form above (just click next to the Order Now tab). We've been working for years with clients from all industries, so we're happy to provide special services we know make your life easier, like simple drop shipping forms and one-on-one advice from our Gift Experts.